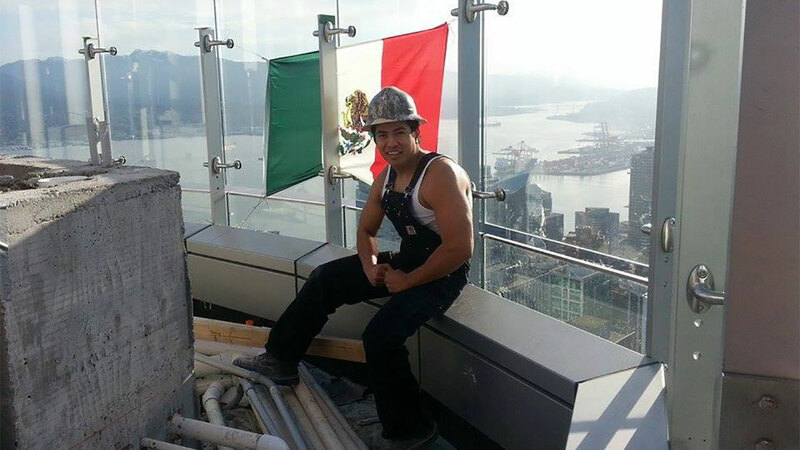 VANCOUVER, British Columbia -- A construction worker says he took a stand against Donald Trump's immigration policies by hanging a Mexican flag atop the Trump International Hotel in Vancouver. In the photo posted on Facebook Saturday, Diego Saul Reyna is seen posing in his construction helmet next to the green, white and red flag. Reyna says he made the move "because from the concrete pouring, finishing, drywall, taping, wood forming and general labor, Mexicans were there, building it, doing good work," he wrote in his Facebook post. The Republican presidential candidate has vowed to make Mexico pay for the barrier he wants to build along the length of the 2,000-mile border between the U.S. and Mexico, and has proposed measures such as raising visa and border card fees, seizing remittances, imposing tariffs and cutting foreign aid. Trump has also said Mexican immigrants bring crime and drugs to the U.S. and are "rapists." "While working on your tower Mexicans didn't steal anything nor raped anyone, we just did the best work we could possibly do, for my ourselves, our families and the future tenants in your building," Reyna wrote in the post, which has been shared more than 5,500 times. The flag was reportedly removed by Sunday. The Trump organization did not immediately respond to ABC News' request for comment. The hotel remains under construction and is set to open this fall.